Jubal receives the 2013 DCE Championship flag. Dutch drum and bugle corps Jubal from Dordrecht, captured the Drum Corps Europe (DCE) European Championship title Saturday, Sept. 28 by a slim margin of five hundredths of a point. Jubal edged two-time defending champion The Company from Barnsley, South Yorkshire, England with a score of 88.45 to 88.40, taking home the DCE Championship Cup from Parkstaad Limburg Stadium in Kerkrade, the Netherlands. Juliana, also from the Netherlands, took third place with a score of 85.05 followed by the Kidsgrove Scouts, a British corps that won the DCE Championship in 2010. Jubal won its last DCE Championship in 2009 and may be familiar to North American drum corps fans who saw the group take part in the 2011 Drum Corps International Tour in the United States during the corps' 100th anniversary season. Jubal's 2013 production titled "The Deadly Game," told the story of a murder mystery that only literary character Sherlock Holmes could solve. The five-movement show utilized musical selections from the Sherlock Holmes movies, the Doctor Who television series and others sources. Also on Saturday in DCE's Junior Class Division, Jong Jubal took first place, completing a sweep of both divisions for the Jubal organization. Fellow Dutch rivals Johan Friso and Jong Beatrix took second and third respectively. 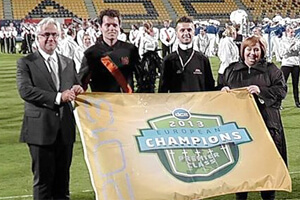 More than 20 drum corps from the Netherlands, Italy, United Kingdom, France, Germany and Ireland competed at this year's DCE European Championship. 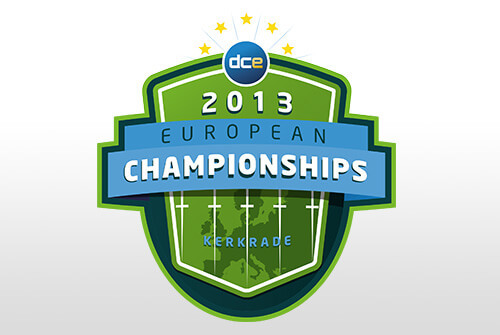 View all scores from the DCE European Championship.